We describe an adolescent female affected by PRKAG-2 gene mutation misdiagnosed to have hypertrophic cardiomyopathy (HOCM) and/or Wolf-Parkinson White (WPW) syndrome. Despite ablation of the suspected accessory pathways, she experienced life-threatening arrhythmias. We aim to reiterate the importance of early recognition of this entity and possible placement of implantable cardioverter-defibrillator (ICD) early in the course of management to prevent catastrophic arrhythmias and possible sudden cardiac death. 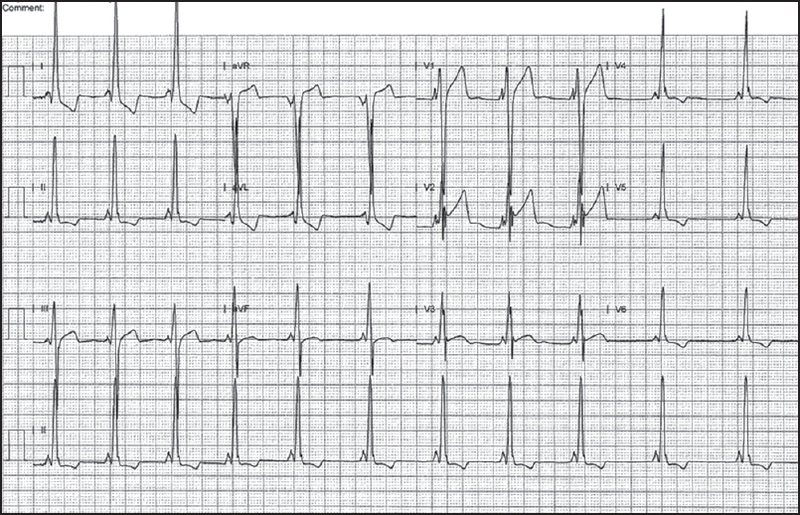 A 14-year-old girl presented with sudden onset of pre-excited atrial fibrillation with a rapid ventricular response. She was hemodynamically stable and was treated with a procainamide bolus, which converted the rhythm to sinus. She was then transferred to our facility for further work-up and management. At presentation, she was alert and oriented with no distress. She had a heart rate (HR) of 71 bpm with a normal respiratory rate, blood pressure, physical exam, complete blood count (CBC), and basic metabolic profile. She was believed to have hypertrophic cardiomyopathy and WPW syndrome with multiple accessory pathways first diagnosed 4 years prior to this presentation. At that time, she underwent successful ablation of a two rapidly conducting accessory pathways in the right antero-lateral and left lateral atrioventricular (AV) groove. She had a third mid-septal to antero-septal pathway; however, this pathway was not ablated at the time, due to the relative proximity to AV node, the limited antegrade conduction properties, and the lack of retrograde conduction. She was treated with atenolol. One week prior to current admission, she had a syncopal event while doing her normal activities and a Holter performed at that time demonstrated tachycardia. The type of tachycardia however was not specified in the records and the tracings were not available for review. The patient had a strong family history of heart disease. Her mother had WPW syndrome and hypertrophic cardiomyopathy (HCM) and had atrial fibrillation at 12 years of age. She subsequently had placement of an ICD. Her maternal uncle, who was previously healthy, died suddenly at the age of 32 years. Also, her maternal cousin had WPW syndrome. Electrocardiography (ECG) at the time of presentation to our hospital showed evidence of ventricular pre-excitation [Figure 1]. There was concentric left ventricular hypertrophy with left ventricular diastolic septal thickness of 1.38 cm (z score 3.82) [Figure 2], which was comparable to her previous echocardiogram 4 year earlier. Her anatomy was otherwise normal with normal systolic ventricular function. 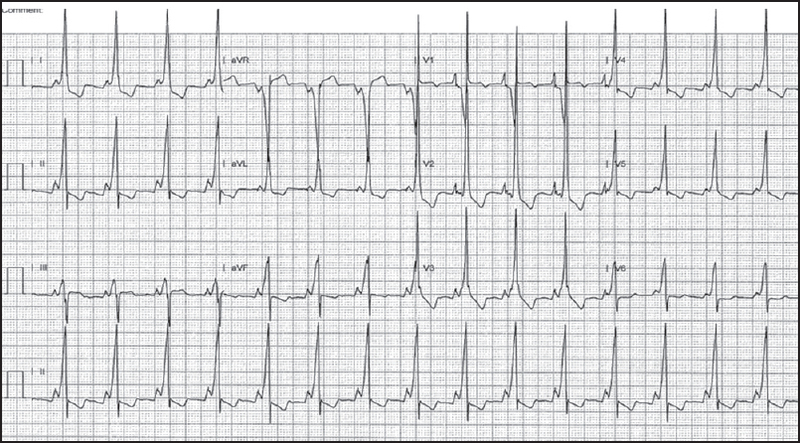 Considering the past history of WPW and evidence of pre-excitation on ECG, she underwent electro-physiological testing. Surprisingly, two new accessory pathways (right postero-septal, right lateral) were mapped besides the midseptal pathway which was present at the first electrophysiological testing. Both right-sided pathways were successfully ablated. The midseptal pathway demonstrated delayed elimination (10-15 seconds) with application of radiofrequency energy, though this was soon followed by accelerated junctional rhythm requiring termination of the lesion. This accessory pathway, as noted previously, had limited antegrade conduction and no retrograde conduction. Her post-operative course was remarkable for the development of a variety of AV conduction findings. Post ablation ECG demonstrated normal AV node conduction with persistence of pre-excitation, though a different delta wave pattern [Figure 3]. On post-operative day 4, she developed sinus rhythm with first-degree AV block and no evidence of ventricular pre-excitation. Two days later, this progressed to compete AV block. The following day, her AV node conduction returned, though there was still no evidence of pre-excitation. On post-operative day 9, ventricular pre-excitation was once again evident. She underwent implantation of a dual chamber ICD in view of the episode of high-grade AV block and history of syncope in the setting of hypertrophic cardiomyopathy [Figure 4]. Genetic testing demonstrated the patient to be heterozygous in the PRKAG2 gene coding for a missense mutation defined as c.1589 A > G. This gene is predicted to result in amino acid substitution p. His530Arg. The c.1589 A > G variant has not been observed in 5,700 healthy individuals sequenced in the NHLB1 exon sequencing project and 1,000 genomes project. Genetic counseling was provided to the patient and her parents. Genetic testing for the mutation was also advised for her mother and affected relatives. PRKAG2 syndrome is a rare autosomal dominant essentially heart-specific non-lysosomal glycogenosis. Typically, affected patients present in late adolescence, have evidence of pre-excitation on ECG with frequent paroxysms of supra-ventricular tachycardia and frequently progress to high-grade conduction system disease requiring placement of a pacemaker device by fourth to fifth decade of life. A significant proportion of these patients develop mild to severe cardiac hypertrophy that progresses to dilated cardiomyopathy. It is notable that the arrhythmogenic nature of the disease is not caused due to a defect in ion channel or a structural protein. Rather, PRKAG2 gene encodes the γ 2 regulatory subunit of adenosine monophosphate (AMP)-activated protein kinase (AMPK) and thus it is a disease of cardiac metabolism. AMPK enzyme activity serves a critical role in regulating cellular glucose and fatty acid metabolic pathways. In situations of increased cellular energy demand in muscle, AMPK activation promotes adenosine triphosphate (ATP) repletion by facilitating cellular glucose uptake and oxidative metabolism. A perturbation in the exquisite regulation of these metabolic pathways, as caused by mutations in the regulatory subunit of AMPK, leads to a derangement in cardiac metabolism, giving rise to the profound cardiac phenotypes described. Ideally, the diverse clinical features of the PRKAG2 cardiac syndrome should be explained by a single dominant cellular abnormality resulting from altered AMPK activity. The findings of Wolf et al.,  provide strong evidence that excessive cellular glycogen content alone is a unifying mechanism of disease pathogenesis for the variable phenotypes manifested in affected patients. The degree of cardiac hypertrophy observed on imaging will be dependent on the extent of myocyte enlargement secondary to glycogen accumulation. Similar to our patient, this is often diagnosed as hypertrophic cardiomyopathy on echocardiography despite widely differing pathogenesis. Why some patients demonstrate extraordinary hypertrophy and other affected members of the same family do not remains an enigma. It most likely reflects a role of functional polymorphisms of other genes influencing cellular glucose metabolism. The presence of ventricular pre-excitation is also the result of cellular enlargement due to excessive glycogen content, resulting in the disruption of the normal development of the annulus fibrosus, as observed by Wolf et al. 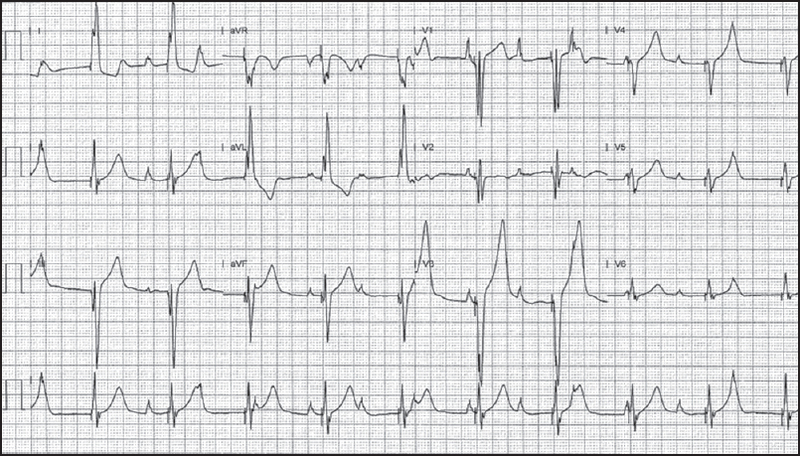 The end result is ECG evidence for ventricular pre-excitation and, in the context of frequent supraventricular arrhythmias, it might be erroneously labeled as WPW syndrome. As the patients age, myocytes gradually accumulate more and more glycogen. These swollen myocytes conduct impulses from atria to ventricles at various locations and are diagnosed as aberrant AV conduction pathways on electrophysiological studies. In a child with idiopathic cardiac hypertrophy and presumed sporadic cardiomyopathy, who was negative for mutations in nine of the known HCM genes, Morita et al.,  identified heterozygosity for a missense mutation in the PRKAG2 gene (H530R; 602743.0009). The mutation was not found in unrelated individuals matched by ancestral origin or in more than 1,000 control chromosomes. We describe the clinical case of an adolescent girl who had the typical presentation of the disease with the genetic mutation in PRKAG2 gene. Even a patient with the classical phenotype may be missed because of lack of physician awareness. Diagnosis in our patient was not considered for a few years and she experienced life-threatening arrhythmias. We stress the importance of early recognition of this entity as these patients have a progressive disease. Subjecting these patients to ablation procedures is fruitless as the aberrant conduction is due to swollen glycogen accumulated cardiac myocytes and not due to accessory pathways. Future possibility for gene therapy for this serious illness needs to be explored in detail. Until such disease reversing therapies are explored, these patients should be considered for early ICD placement as therapy for life-threatening arrhythmias and to prevent catastrophic events and sudden cardiac death. Doevendans PA, Wellens HJ. Wolff-Parkinson-white syndrome: A genetic disease? Circulation 2001;104:3014-6. Gollob MH, Green MS, Tang AS, Gollob T, Karibe A, Ali Hassan AS, et al. Identiﬁcation of a gene responsible for familial Wolff-Parkinson-White syndrome. N Engl J Med 2001;344:1823-31. Ehtisham J, Watkins H. Is Wolff-Parkinson-White syndrome a genetic disease? J Cardiovasc Electrophysiol 2005;16:1258-62. Gollob MH, Seger JJ, Gollob TN, Tapscott T, Gonzales O, Bachinski L, et al. Novel PRKAG2 mutation responsible for the genetic syndrome of ventricular preexcitation and conduction system disease with childhood onset and absence of cardiac hypertrophy. Circulation 2001;104:3030-3. Seidman JG, Seidman C. The genetic basis for cardiomyopathy: From mutation identiﬁcation to mechanistic paradigms. Cell 2001;104:557-67. Richard P, Charron P, Carrier L, Ledeuil C, Cheav T, Pichereau C, et al. EUROGENE Heart Failure Project. Hypertrophic cardiomyopathy: Distribution of disease genes, spectrum of mutations, and implications for a molecular diagnosis strategy. Circulation 2003;107:2227-32. MacRae CA, Ghaisas N, Kass S, Donnelly S, Basson CT, Watkins HC, et al. Familial hypertrophic cardiomyopathy with Wolff-Parkinson-White syndrome maps to a locus on chromosome 7q3. J Clin Invest 1995;96:1216-20. Sidhu J, Roberts R. Genetic basis and pathogenesis of familial WPW syndrome. Indian Pacing Electrophysiol J 2003;3:197-201. Gollob MH, Green MS, Tang AS, Roberts R. PRKAG2 cardiac syndrome: Familial ventricular preexcitation, conduction system disease, and cardiac hypertrophy. Curr Opin Cardiol 2002;17:229-34. Kemp BE, Mitchell KI, Stapleton D, Michell BJ, Chen ZP, Witters LA. Dealing with energy demand: The AMP-activated protein kinase. Trends Biochem Sci 1999;24:22-5. Wolf CM, Arad M, Ahmad F, Sanbe A, Bernstein SA, Toka O, et al. Reversibility of PRKAG2 glycogen-storage cardiomyopathy and electrophysiological manifestations. Circulation 2008;117:144-54. Morita H, Rehm HL, Menesses A, McDonough B, Roberts AE, Kucherlapati R, et al. Shared genetic causes of cardiac hypertrophy in children and adults. N Engl J Med 2008;358:1899-908.